To Cite: Johari B, Abdul Aziz Y F, Krishnasamy S, Looi L M, Hashim S A, et al. Metastatic Adenocarcinoma Presenting as Extensive Cavoatrial Tumor Thrombus, Iran J Radiol. 2015 ; 12(2):e11197. doi: 10.5812/iranjradiol.11197. The presence of tumor thrombus in the right atrium is frequently the result of direct intraluminal extension of infra-diaphragmatic malignancy into the inferior vena cava (IVC) or supradiaphragmatic carcinoma into the superior vena cava (SVC). Right atrial tumor thrombus with extension into both SVC and IVC has not been reported in the literature. We present a patient who presented with symptoms of right atrial and SVC obstruction. Imaging revealed presence of a thrombus in the right atrium, extending to the SVC and IVC, with the additional findings of a left adrenal mass and multiple liver lesions. The histopathological examination of the right atrial mass revealed metastatic adenocarcinoma cells. The patient was given a presumptive diagnosis of metastatic adenocarcinoma, most likely adrenal in origin, with multiple hepatic lesions suspicious for metastasis. The clinical outcome of the patient was not favorable; the patient succumbed before the adrenal mass could be confirmed to be the primary tumor. This case highlights that in patients manifesting with extensive cavoatrial thrombus as, the existence of primary carcinoma should be considered especially in the adrenal cortex or in the lung. The presence of tumor thrombus in the right atrium is frequently the result of direct intraluminal thrombotic extension of infradiaphragmatic malignancy such as renal or hepatocellular carcinoma into the inferior vena cava (IVC) or thyroid carcinoma into the superior vena cava (SVC). Right atrial tumor thrombus with extension into both SVC and IVC has not been reported in the literature. Primary adrenal tumors presenting as cardiac masses are rare. A 42-year-old man, with previous history of treated pulmonary tuberculosis, presented with progressive shortness of breath, reduced effort tolerance, facial puffiness and upper limb swelling over a period of several months. On examination, the patient was hypotensive, tachycardic and hypoxic. 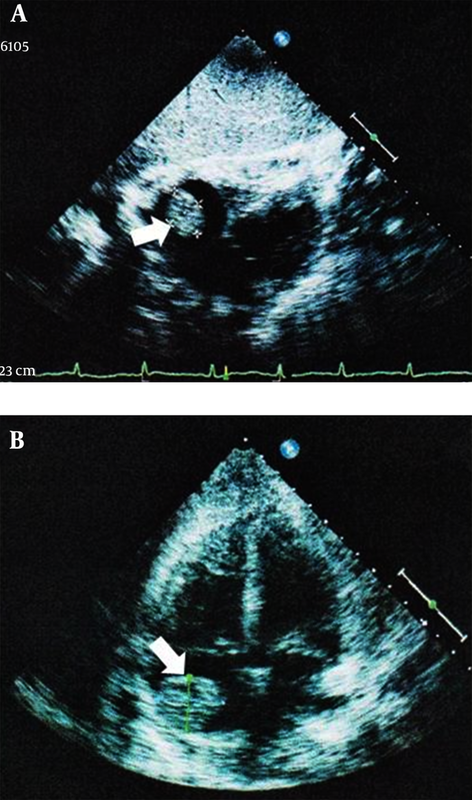 Initial transthoracic echocardiogram revealed a large mass in the right atrium, with pericardial effusion (Figure 1). The left sided structures were normal in size and function. The provisional diagnosis at this time was right atrial myxoma. The electrocardiography (ECG)-gated cardiac computed tomography (CT) using a 64-slice duals Source CT system (Siemens Medical Solutions, Malvern, PA, USA) revealed a minimally enhancing thrombus in the right atrium, extending to SVC the superior vena cava (SVC), subclavian veins and inferior vena cava (IVC), with mass effect on the left main and IVC, with mass pulmonary artery and the right ventricle (Figure 2). 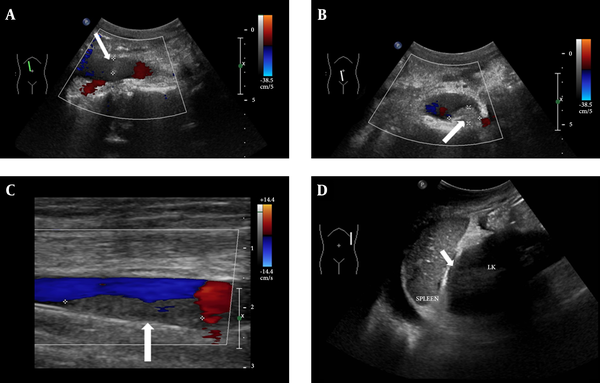 Doppler ultrasonography (US) of the abdomen and lower limbs showed extensive thrombus in the IVC and left femoral vein, as well as a left suprarenal mass (Figure 3). A decision was made to perform sternotomy for right atriotomy and SVC venotomy, as there was a high risk of pulmonary thromboembolic phenomenon. Intraoperatively, the right atrium was found to be filled with a densely adherent organized white thrombus, extending to IVC, SVC and innominate veins. Evacuation of clots was performed (Figure 4). Although the surgical procedure was complicated by massive blood loss, the patient slowly recovered with intensive care. The histopathological examination of the right atrial mass revealed metastatic poorly-differentiated adenocarcinoma cells, exhibiting mucin-positive cytoplasmic vacuoles, which were immunopositive for cytokeratin 7 and thyroid transcription factor-1 (TTF-1) (Figure 5). The origin could not be ascertained. Postoperative CT angiogram revealed patent SVC and residual thrombus in both internal jugular veins, brachiocephalic trunk and infero-lateral aspect of the right atrium. In addition, a left adrenal mass (as noted on preoperative US) and multiple cystic liver foci were evidenced (Figure 6). The patient was given a presumptive diagnosis of metastatic adenocarcinoma, most likely adrenal in origin, with multiple hepatic lesions suspicious for metastasis. There were no elevated tumor or hormonal markers to support the diagnosis of functioning adrenocortical carcinoma. The lungs, thyroids and kidneys were deemed clear from the CT scans. Further endoscopic examination of the gastro-intestinal tract for primary tumors could not be completed, as the patient was not fit for the procedure. During the course of the stay, the patient’s condition worsened, with development of gangrene of the digits of all limbs, bacteremia and sacral sores. Despite intensive care, the patient expired less than 2 months after the first admission. No autopsy was performed, conforming to the wishes of the family members. Figure 1. A 42-year-old man presented with progressive dyspnea, facial puffiness and upper limb swelling.Transthoracic ehocardiogram showing a mass in the right atrium (arrows): A, subcostal approach and B, apical four chamber view. Figure 2. A, Computed tomography (WW: 350, WL: 50). coronal reconstruction showing right atrial tumor thrombus extending into the SVC (arrow) and right brachiocephalic vein; B, Computed Tomography (WW: 350, WL: 50) in axial section showing thrombus within the right atrium (arrow); C, Computed Tomography (WW: 600, WL: 200) in axial section showing thrombus within the intrahepatic IVC (arrow), extending to the hepatic veins; D, Computed Tomography (WW: 600, WL: 200) in axial section showing thrombus within the intrahepatic IVC (arrow); E, Computed Tomography (WW: 600, WL: 200). In coronal reconstruction Coronal reconstruction showing patent main pulmonary arteries (arrow).Abbreviations: IVC, inferior vena cava; SVC, superior vena cava; WL, window length; WW, window width. Figure 3. A, Doppler US showing thrombus in the proximal IVC (arrow); B, Doppler US showing thrombus in the distal IVC (arrow); C, Doppler US showing thrombus in right superficial femoral vein (arrow); D, US showing ill-defined left suprarenal mass (arrow). Abbreviations: IVC, inferior vena cava; SVC, superior vena cava; US, ultrasound. Figure 4. A, Intraoperative finding of intra-atrial tumor thrombus extending to the SVC and IVC; B, Excised mass in macroscopic section. Abbreviations: IVC, inferior vena cava; SVC, superior vena cava. Figure 5. A, Histopathological examination of the right atrial mass revealed malignant epithelial cells with moderate nuclear pleomorphism and high mitotic activity; these show poor gland formation and occasional cytoplasmic vacuoles containing mucin (H and E, 200 ×); B, Tumor cells from the atrial mass exhibiting nuclear immunopositivity for TTF-1. (Immunohistochemistry for TTF-1, 200 ×). Abbreviations: HE, hematoxylin and eosin; TTF-1, thyroid transcription factor-1. Figure 6. 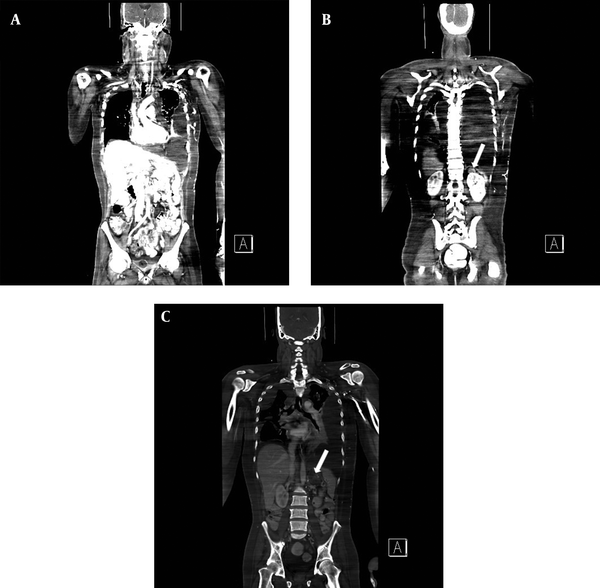 A, Postoperative coronal reformatted CT images (WW: 350, WL: 50) showing that most of the right atrial and SVC tumor thrombus has been removed; B and C, Postoperative coronal reformatted CT images depicting left suprarenal mass (arrow). Abbreviations: CT, computed tomography; WL, window length; WW, window width. Primary cardiac tumors are rare, with atrial myxomas accounting for the vast majority of cases (1). These primary tumors are most often intracavitary, leading to obstruction and arrhythmias. In comparison to primary tumors, metastatic cardiac neoplasms occur more frequently (1, 2). However, the intracavitary growth of these tumors is less common, and therefore the patients may be asymptomatic and are only found to have cardiac involvement during post mortem examinations (1). Another entity that can mimic intracavitary cardiac mass is thrombus formation (2). Every malignant tumor in the body has the potential to metastasize to the heart, the commonest being malignant melanoma, carcinomas of the lung, breast, esophagus, angiosarcoma, lymphoma and leukemia (1-3). The pathways for spread of cardiac metastases include direct contiguous extension, lymphatic or hematogeneous spread and much less commonly through transvenous spreading. The lymphatic spreading of tumors usually appear in the form of pericardial metastases, while the hematogeneous spreading commonly gives rise to myocardial metastases (1). Tumor thrombus extension into the right atrium usually occurs via the transvenous route, from the SVC (thyroid, lung or thymic carcinomas) or IVC (Wilm’s tumor, renal, uterine or hepatocellular carcinomas) (1, 4-6). Review of the literature revealed no report of a case of thrombus involving th eright atrium extending to both SVC and IVC.. Our patient’s clinical presentation with progressive shortness of breath and facial and upper limb swelling is typical of superior vena cava involvement and right atrial congestion. Other presenting features of intra-atrial cardiac metastases include chest pain, hypotension, Kussmaul breathing and arrhythmias (1). In investigating a suspected cardiac mass, two-dimensional transthoracic or transesophageal echocardiography is usually considered the frontline investigation (1) as it is non-invasive, readily available and accurate in when performed by experienced specialists. Pericardial effusion, regional wall motion abnormalities, and intra-cavitary masses can be examined with high sensitivity. The next in line is CT, in particular an ECG-gated cardiac CT, as this would better delineate the intracardiac tumor and local extension, as well as evaluate adjacent structures. In our case, the extent of the thrombus was clearly depicted, and the neck and lungs were examined for primary tumors at the same session. Postoperative CT successfully detected the presence of left adrenal mass and small cystic liver foci suspicious of metastases, while the kidneys were deemed clear of masses. This has helped greatly in narrowing down the differential diagnoses of the primary tumor. Magnetic resonance imaging (MRI) also play a great role in investigating cardiac masses (1). However, this examination was not performed for our patient due to temporal and financial constraints. It is generally accepted that the incidence and progression of venous thrombosis in cancer patients are increased as compared to the general population, with 10% prevalence of occult malignancy after an episode of unexplained venous thrombosis (7). The increase in the risk of venous thrombosis in patients with malignancy is attributed to a hypercoagulability state, vessel wall damage and venous stasis. The composition of bland venous thrombus include platelet, red blood cells, fibrin and inflammatory cells, while the less common tumor thrombus also contains malignant tumor cells. The differentiation of venous from tumor thrombus is difficult, and more often is possible only by hepatic lesions examination. Several features on CT and MRI can be used to differentiate tumor thrombi from bland ones, the most characteristic feature being the enhancement of the thrombus aftern contrast administration, apart from expansion of the vessel lumen and heterogeneity of the thrombus (7, 8). The extent of massive thrombosis in our patient has prompted the suggestion to look for a primary malignancy, even before the histopathology result came back as malignant in nature. The presence of a left adrenal mass in our patient’s US and CT examinations has raised the possibility of adrenocortical carcinoma, as the primary tumor. As the venous drainage of the adrenals follows the kidneys’ pathway, adrenal tumors have the propensity to extend into the IVC. However, right atrial involvement in malignant adrenal tumors is very rare (5, 9, 10). It is worthwhile to note that while the histopathological examination may not ascertain the primary origin of the tumor thrombus, the cells were TTF-1 positive, increasing the possibility of occult lung adenocarcinoma. The CT scans on both occasions did not reveal the presence of mass lesions in the lungs. However, occult carcinomas could arise within the tuberculosis scars within the parenchyma. Lung carcinomas are also known to spread to the adrenal glands, which could account for the left adrenal mass in this patient. In conclusion, we present a case of a patient with right atrial tumor thrombus extending to both IVC and SVC, should be considered especially in the adrenal cortex or in the lung and liver deposits, suspicious of metastases. The histopathological examination of the thrombus revealed metastatic adenocarcinoma. 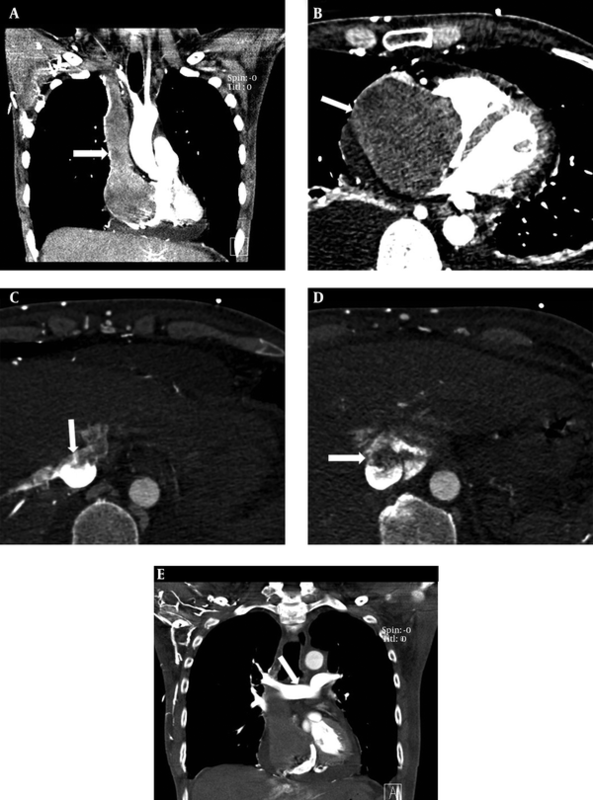 This case highlighted that in patients presenting with extensive cavoatrial thrombus as presented, the existence of primary carcinoma should be considered especially in the adrenal cortex or in the lung. Authors’ Contributions: Bushra Johari and Yang Faridah Abdul Aziz were involved in radiological imaging of this patient and writing of the case report. Sivakumar Krishnasamy, Shahrul Amry Hashim and Raja Amin Raja Mokhtar were the cardiothoracic surgeons managing the patient, and Lai Meng Looi prepared the histopathology report. Funding/Support: We thank the University Malaya Medical Center for their valuable support.